With Wi-Fi Talkie you can organize communication between devices at distances of Wi-Fi signal without using an Internet connection or a cellular network. 1. 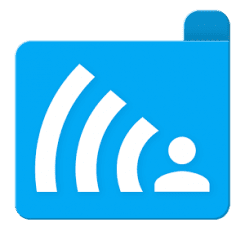 Connect an existing Wi-Fi Network or create your own wireless network based on a Hotspot* of your phone or tablet, using “Network Manger” of Wi-Fi Talkie. 2. Say people around you to connect the network you are connected. 3. Now you can use full functionality of Wi-Fi Talkie! The range of Wi-Fi signal depends on a hotspot and connected devices. Usually the range is not more than 50 meters (150 feet) indoors and up to 150 meters (450 feet) outdoors. • Now you can communicate with people in previously unavailable places: airplane, train or any other long-distance transport, forest and mountains, stadium, concert hall and other public places where a cellular signal is weak. • Wi-Fi Talkie is also well suited for communication within a Wi-Fi network of your home, office, school, university or dorms. (*) If you create a hotspot while your device’s Internet connection enabled, then Internet tethering (sharing) becomes activated. Wi-Fi Talkie Localized to: English, Russian (Русский), Spanish (Español), Burmese (ျမန္မာ), Bengali (বাংলা), German (Deutsch), Turkish (Türk).